Beetroot thoran is an authentic Kerala Stir fry Recipe. Beetroot is Cooked till soft then mixed with Coconut Spice mixture.The aroma of coconut makes the thoran more flavourful.Beets are rich in folic acid, so pregnant women should include beets in their diet.Beets are rich in calcium,so it is Good for teeth & bones. Beetroot - 2 cups heaped(Grated). Coconut Grated - 1/2 cup. Pearl Onion (Ulli) - 2. Grate the Beetroot & Coconut. Heat the oil, add mustard seeds.When it splutters add urad dal & curryleaves.When dal turns Golden brown colour add hing.Give a quick Mix. Add Grated Beetroot & little salt. (Add salt for faster cooking). Saute now & then in a medium low flame, till it turns Soft.Cook it covered for fast cooking. if beetroot is not tender, sprinkle little water while cooking. Meanwhile Grind Coconut,Cumin seeds,chilli powder,turmeric Powder,Garlic,Pearl onion & salt (Adjust salt), into a dry little course mixture. 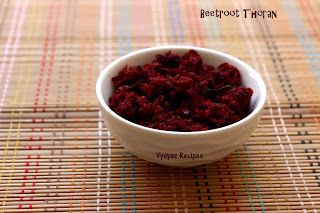 When beetroot turns soft, add Ground Coconut Mixture,saute for 2 - 3 minutes, in a low flame. Serve with Rice,chapathi or Roti. Instead of chilli Powder, you can use Red chillies. Always use fresh Coconut for Good taste. Instead of Grating beetroot you can also chop finely. Add a tsp of coconut of oil, at last & switch off, for nice flavour.